Planning a destination wedding is tough. I know because I’ve planned hundreds! I’ve also planned my own. Although it wasn’t a destination for me, it was for many of my guests. 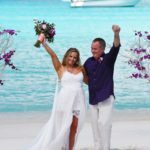 If you’re considering a destination wedding, take a look at this blog, since I’ve interviews myself and 2 other brides to answer some of the background questions that you may not think of. Myself, Laysha, of Irie Matrimony- My wedding was in St. Thomas, where I live. I am a wedding coordinator. Stephanie- Her wedding was also in St. Thomas. She is not a wedding vendor but helps out a lot on all the bride forums on Facebook. Ashley- Her wedding was in Maui, Hawai’i. I call her my paper lady. She does invitations for brides in the New Hampshire and surrounding areas. Question 1. 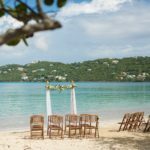 What was the most stressful part of planning your destination wedding? Laysha: I wasn’t hugely stressed for much of the wedding planning. When I got about 2 months out, that’s when the stress started kicking in. The 3 biggest stressors for me were the dress, the invitations and all the guests coming from out of town. I had never been apart of the dress or invitation parts of the wedding planning, so I was not accustomed to the plans. As for my guests: I wanted them to all have an amazing time and tried to plan that out myself. It was too much. Stephanie: The most stressful part of planning my wedding was the communication with the resort that was constantly going through different coordinators. Trying to make sure everyone had their reservations where needed, flights booked, and so nervous to make sure everyone was going to have a fabulous trip… even though there were so many elements that were just entirely out of my control. And, accepting that Island Time is Real!! Of course when you’re getting married everyone is going to give you their opinion too, it took some time before I was able to accept the fact that I cannot make every single person happy and that this is My future husband and my most beautiful today, so if someone didn’t like something, too bad for them! This was our day! Ashley: EVERYTHING! 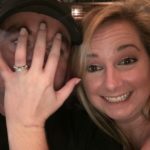 Our situation was VERY unique; we “won” our wedding. 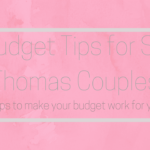 Lots of family dynamic things, money stressors, not being able to meet vendors in person, or see our venue ahead of time, short time planning, and transporting a dress and other wedding things. Question 2. How long were you actively planning your wedding? Laysha: Actively? We got engaged in August, so about 7 months. Stephanie: Actively, 8-10 months for making all of the decisions. Ashley: We found out we won our wedding the last week in February and had our wedding in September, so about 6 months! Question 3. How did you feel after the wedding was over and you were back home? Laysha: Well, I was home the whole time, but after everyone left, I was a little depressed. 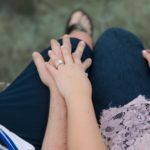 It wasn’t because I was married–I was thrilled to be married to the man of my dreams, it was because the last 2 months was solidly booked with planning my wedding, and when all the festivities were over, I was just kind of lost. Like, what do I do now? It took me a couple of weeks to get back to working a normal schedule. Stephanie: So happy to be married to my best friend and to be able to use the word husband anytime I want! We were still under the gun once we got back home because we were hosting a reception back at home too, but honestly, once “normal” life resumed, I was lost! I had been planning for so long. Question 4. Was it easy for you to jump back into your regular life? Laysha: No. It was hard for me to answer emails. It was hard for me to plan the other weddings I had coming up. The whole thing just kind of felt anti-climactic. Again, it’s wonderful that I’m married, but the after-effects of the wedding planning just made me want to watch Netflix or scroll through Facebook. Stephanie: I almost didn’t know what to do with myself! 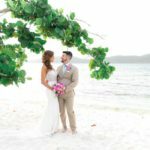 I was thankful to be a part of multiple island bride pages and share my experiences, opinions, and recommendations for both future and past brides. Ashley: We were both just glad to NOT be planning anymore. Although we did have our at-home reception a couple of months later. We are just happy to be married and done with planning. Question 5. Is there anything you wish you would’ve known going into the planning? Laysha: I wish someone had written a blog like this to give me an idea of how it’s going to be immediately after everything calms down. I also wish someone had told me–and made me believe–that I don’t need to go all out on the planning. People are expecting less from me than I expect from myself. Stephanie: Honestly, with social media the way that it is these days — take advantage! Find a group, find a page that you like.. just being able to shoot ideas back and forth with past/future brides about dresses to vendors to entertainment, will help to ease your mind like you wouldn’t believe. 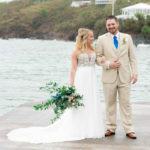 It’s a complete whirlwind… Our island wedding was everything that I imagined and more. Ashley: I pretty much figured out what I needed to know – just wish I had more time and money to work on the details of the day. Question 6. What advice would you give brides and grooms who are currently planning their destination wedding? Laysha: I’ll start with the cliche advice that everyone gives, so please if you’re planning your wedding, listen: Relax on your wedding day and take it all in. It will pass so quickly. Also, Don’t worry about small details. No one will notice if they’re not just so. And one more: surround yourself with an amazing support group and amazing vendors. I couldn’t have done this without the people around me that love me and my vendors… they’ll never know how much I appreciate their hard work. Stephanie: Just to breathe, and not to sweat the small stuff. Remembering every single little detail is impossible and something is bound to go array.. remember you may want everything to be “just perfect” but the most comfort that I found was knowing that I was going to be getting married to the man of my dreams and at the end of the day, that’s the most important part. And of course in tropical paradise!!! Ashley: I have heard of some places offering a discounted rate to come down and visit the site etc, I would DEF do that, and meet with your potential vendors. It’s a big relief to know where, when and how things will progress the day of. We flew a couple of days early to do it but for a typical destination wedding. I would recommend going for a vacation one year and then maybe getting married the following! No one ever talks about what happens AFTER the wedding. Hopefully, that will change! If you’ve just finished planning your wedding and you feel lost, you’re not alone! 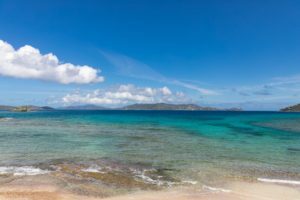 If you’re planning your destination wedding now, get ready to feel this way after the wedding is over, and be sure to have things in place for you to get back to reality.